Mikey - Paso Robles ca Fits 2007 Harley street glide like a Glove ! "It's a great cover had for months and months and still looks new . Also it breathes very well keeping bike dry ." Corroded - SF, CA Great Bikini top (wet or dry) "I got this for my 2003 Busa because I'm working in an industrial area and the bike was getting coated in smudge... Also, it is raining in SF now (Jan - Mar) and its nice to be able to roll it up and start on my way home with a dry top of the bike. Having it's own stuff sack is a bonus. In the rain, I turn it inside out, roll it up and stuff it. My hands stay mostly dry this way and the Gloves do not stick!" The idea of a motorcycle cover may seem a little strange considering the bike sits inches from the ground, its engine is already exposed, and the dirt, grease and grime from the road constantly bombard the bike when in motion. We'll admit it, that's all true. But a motorcycle is a thing of beauty and the best way to keep it looking good is by using a motorcycle cover. The fact is an idle bike faces other threats like dust, rain, the sun and even garage accidents and spills. Why further expose your bike to the elements when you can prevent further wear with a motorcycle cover? If your bike is parked outside, its longevity rests on how well it's protected. Rain and the constant beating of the sun can break down engine parts, leather and plastic components much faster than if a bike is covered. In the garage, there's always dust and the possibility of spilled liquid or other harmful substances. High quality motorcycle covers offer water-proofing and UV protection to keep your ride newer, fresh looking and protected. Motorcycle covers are easy to take on and off and some come equipped with locking mechanisms. 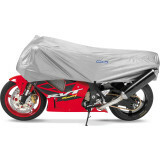 We stock more than 40 different motorcycle covers from 12 different manufacturers. 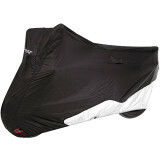 Choose from half covers, full covers and even motorcycle covers the entire bike fits in, including tires! Whatever your ride we have the right motorcycle cover. Choose from genuine Honda, Suzuki, or Yamaha GYTR covers or select a style you like from any of our other aftermarket specialists. We stand under them all! At MotoSport you'll be able to find the motorcycle cover you need to keep your bike protected and looking new. Want help? Call our toll free line 866-677-7338 or chat with an expert. Get the largest selection of motorcycle covers on the web and get free 3-day express shipping on any order Over $79 from MotoSport.